December 12, 2011, Santa Barbara, CA – Memory Glass®, a memorial keepsake company, is pleased to announce the expansion of its operations with the addition of new glass-blowing equipment. These exciting changes are due to the increase in demand for Memory Glass products – hand-blown glass keepsakes infused with cremated remains, soil from a burial plot or sand. The expansion will be complete at the start of 2012. 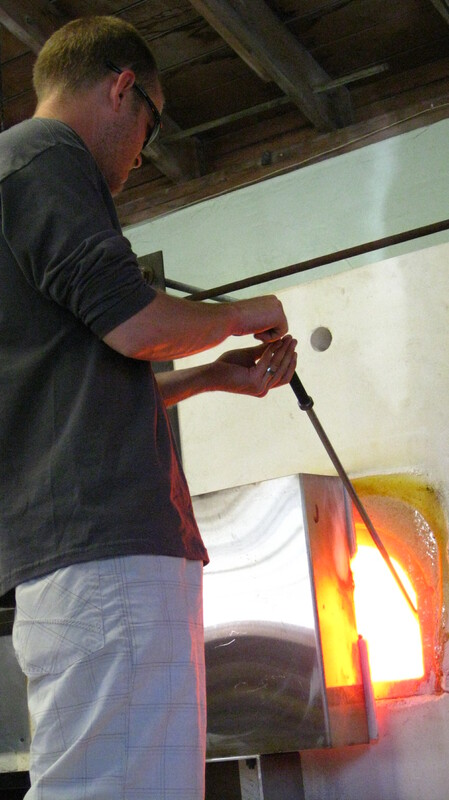 Memory Glass Artist Nick Savage begins the Memory Glass Memorial creation process by first pulling 2,000°F molten crystal glass from a furnace. The additional top-of-the-line equipment effectively allows a tripling in workload for the company. The new glass furnace accommodates three times the current quantity of usable molten glass for order creation and the kilns provide sufficient space for finishing orders, enabling the Memory Glass facility to optimize and increase production. A Memory Glass® is a unique solid glass keepsake that eternally preserves cremated remains, soil from a burial site or sand, which are suspended within the glass. Our customizable products are each hand-blown using high-quality crystal glass and colored glass. An extremely small amount of cremated remains, soil or sand is required, giving families the opportunity to create multiple Memory Glasses. When used with cremated remains, the family can still bury or scatter the remainder of the ashes. To become a vendor, contact Memory Glass at (805) 682-6469 or orders@memoryglass.com.